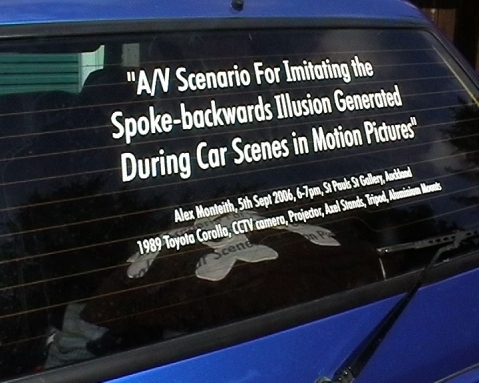 AV Scenario with Toyta Corolla for imitating the spoke-backwards effect generated during car chase scenes in motion pictures. Lowered, custom blue 1989 Toyota Corolla, axle stands, CCTV camera, tri-pod, data-projector & flouro light. Wheels rotated between 3kph and 80kph for the 30min duration of the performance. Lazy Suzy, exhibition curator Mark Harvey. Other artists: Gabriel White, Tessa Laird, Mark Harvey, Ben Holmes, Brydee Rood & others.